I’m such a sucker for carrot cake on my birthday. Not just any carrot cake, though. This carrot cake. This is the recipe that my mom baked for me growing up, and the one that I always asked for. I like this cake because it’s so moist and is just carrot cake. No raisins or nuts. No pineapple. 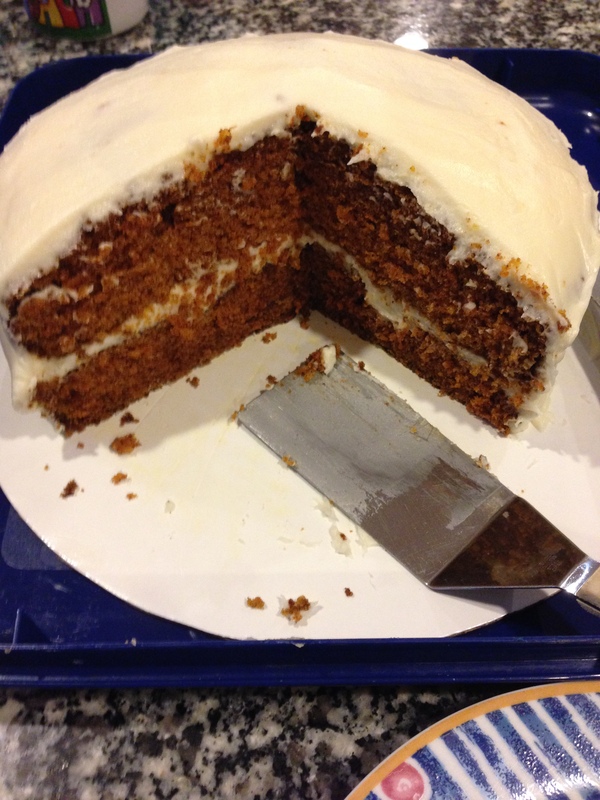 Just unadulterated carrot cake and cream cheese frosting. The last few years I’ve made my own birthday carrot cake, much to the chagrin of my mother and the annoyance of my wife. If I screw it up, it’s my fault. So this year, I screwed up. It was my fault. Although I buttered the baking pans, I elected not to flour them or to cover the bottom with parchment paper. Since the cakes are so moist. they ended up sticking to the bottom of the pans when I flipped them over. I had already taken the stance that the cake was ruined when, luckily, a cooler head prevailed (my wife’s, not mine). She reassembled the pieces of the tops that had broken apart, and then iced the cake. She’s way better at the icing part than I am (and she likes it), so I make the icing and let her do the rest. Patience is a virtue, or so I’m told. I almost tempted fate and attempted another recipe this year, but just couldn’t bring myself to do it. What if I didn’t like it? Would I actually have to bake (and eat) two cakes if I didn’t? (Hmmm, maybe not such a bad idea…) Ultimately, I decided that the disappointment of trying and disliking a new recipe was not worth the trouble and stuck by my favorite carrot cake. Based on a family recipe. For the cake: Heat oven to 350 degrees. Butter and flour two 9″ cake pans. Line with parchment paper, then butter and flour the parchment paper. Combine ingredients in a food processor until well-mixed and carrots are well-integrated. Split cake batter evenly between the two pans. Bake for 50-60 minutes or until cake tester comes out clean. For the frosting: Cream the butter in a stand mixer on medium speed. Add cream cheese and continue to mix. Slowly add the vanilla and confectioner’s sugar, pausing intermittently to allow the sugar to incorporate into butter/cream cheese. Frost the cake with the icing once the cakes have cooled completely. *This is 1.5x the original recipe because we decided that the recipe wasn’t enough icing.